As I wrote five years ago, in two separate posts (Post 1, Post 2), some mad genetic scientists, seemingly out of some sci-fi B-movie, have been messing around with salmon to produce fish that grow faster on farms. There’s really nothing more I can think to say about what a travesty this idea is, especially to people here in the Pacific Northwest, so please consider reading my previous posts linked to in the previous paragraph. The sad news from yesterday, is that the U.S. Food & Drug Administration, the government body that is supposed to keep us safe, has approved the Frankensalmon as fit for human consumption, and they continue to refuse to label this or any other genetically modified food. Within hours of the agency’s decision on Thursday, one consumer advocacy group, the Center for Food Safety, said it and other organizations would file a lawsuit challenging the approval. Despite the approval, it is likely to be at least two years before any of the salmon reaches supermarkets, and at first it will be in tiny amounts. It is not clear how well the salmon will sell. Some leading supermarkets have already said, in response to the vocal opposition, that they have no plans to sell it. So, really, it’s up to us. Friends don’t let friends buy farmed salmon. 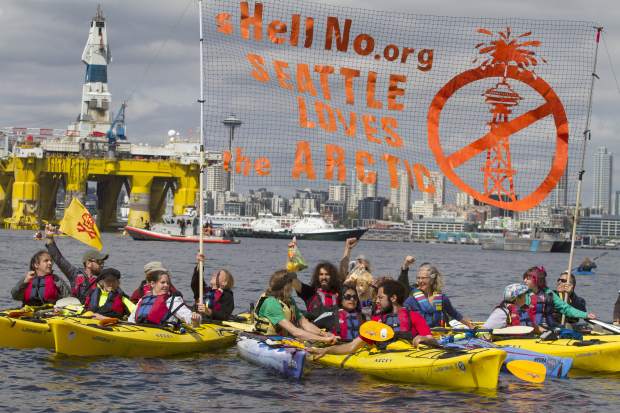 I don’t think many people thought, when the kayak-based protests over a Shell Oil arctic drilling platform in Seattle’s Elliot Bay started a month ago, that the protest would still be going on today. Kayaks have such an iconic presence here in the Pacific Northwest, and though I’ve never owned one myself, I’ve had the pleasure of paddling quite a few times over my 20+ years living here. As a result, and given my radical treehugging tendencies, I can’t help feeling solidarity with the protesters. Paddle on, brothers and sisters! Paddle on!